Amy Collier, 26, from Braintree will undertake a skydive in aid of the UK’s eating disorder charity Beat on 6 October, having herself suffered from eating disorder for five years. 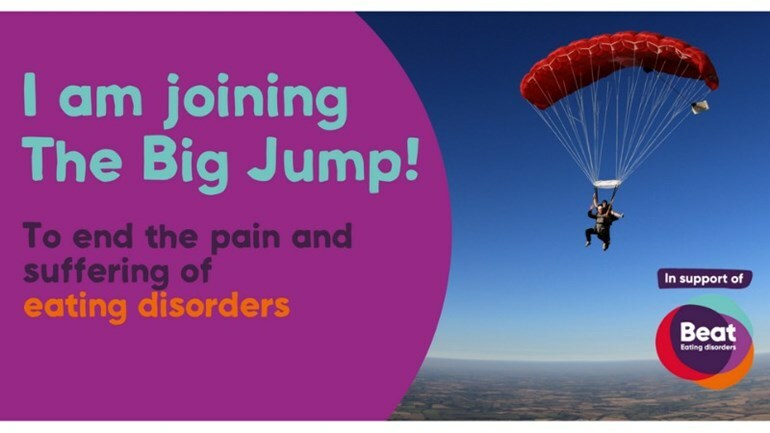 Speaking about her daring challenge and why she wants to fundraise for Beat, Amy said: “Having suffered from anorexia for many years and having to face the daily battle against my mind, I am now so grateful for my new lease of life in recovery. “I want to help others attain the freedom from eating disorders that they so deserve. Amy went through many types of treatment, in-patient, day-patient, and community. She says “I was lucky enough to get the help I needed but unfortunately so many people do not. “Eating disorders not only affect the sufferer but also hugely effect the friends and family surrounding them. I had lifelong friends that turned their back on me whilst I was ill because of how difficult it was to face the changes in me. I felt an outsider often during my years of anorexia, as most social situations became daunting. “I know my family also greatly suffered because of the pressures of dealing with such a consuming illness. An estimated 1.25 million people in the UK suffer from an eating disorder, serious mental illnesses that include binge eating disorder, anorexia, bulimia and other types. Next articleOpen Mic UK heads to Chelmsford this month!